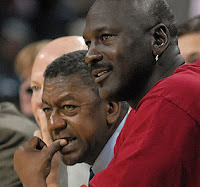 Former Black Entertainment Television owner and Charlotte Bobcats owner Robert (Bob) Johnson, left in photo, has sold the basketball team to former Chicago Bulls basketball legend Michael Jordan, right in photo. 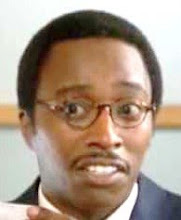 Jordan was already a minority owner and head of basketball operations. It appears that Johnson gave Jordan the deal that the late Washington Wizards owner Abe Pollin never intended to give to the legend. The Bobcats play in the Time Warner Cable Arena.